Place the rice and water in a small saucepan over high heat. Bring to the boil, cover with a lid and reduce the heat to low. Simmer for 20 minutes or until almost tender. Remove from the heat and set aside, covered, for 10 minutes or until tender. While the rice is cooking, preheat oven to 220°C (425°F). Place the lemongrass, chilli and garlic in a small food processor and process until finely chopped. Place in a large bowl, add the salt, kaffir lime leaves, onion, coriander, coconut, eggwhite, salmon and rice and mix well to combine. Place ½ cup of the mixture in the food processor and process until finely chopped. Return to the salmon mixture and mix well to combine. Place ⅓-cupfuls of the mixture on 2 large lightly greased oven trays lined with non-stick baking paper. Cook, turning halfway, for 8 minutes or until golden. To make the cucumber coriander dipping sauce, place the cucumber, coriander, lime juice, fish sauce, honey and water in a small bowl and mix to combine. 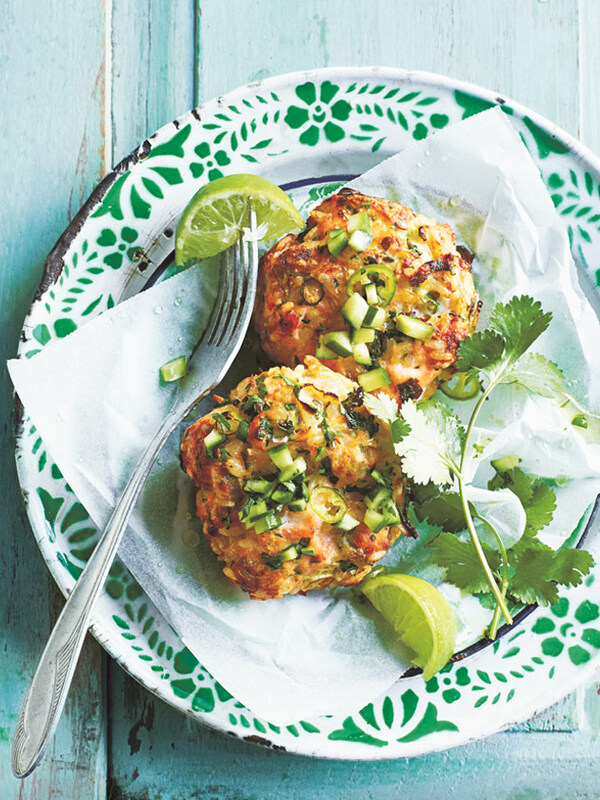 Serve the fish cakes with the dipping sauce, lime wedges and extra coriander. Serves 4.